The Census Bureau released its annual report yesterday on “Income and Poverty in the United States” with lots of newly updated data on household income and household demographics. Based on those new data, I present my annual post titled “Explaining Income Inequality by Household Demographics” (see my previous versions of this analysis for years 2013, 2014, 2015 and 2016). How are high-income households different demographically from low-income households that would help us better understand income inequality? For low-income households today who aspire to become higher-income households in the future, what lifestyle and demographic changes might facilitate the path to a higher income? 1. Mean number of earners per household. On average, there are significantly more income earners per household in the top income quintile households (2.06) than earners per household in the lowest-income households (0.41). It can also be seen that the average number of earners increases for each higher income quintile, demonstrating that one of the main factors in explaining differences in income among US households is the number of earners per household. Also, the unadjusted ratio of average income for the highest to the lowest quintile of 18.0 times ($221,846 to $12,319), falls to a ratio of only 3.6 times when comparing “income per earner” of those two quintiles: $107,692 for the top fifth to $30,046 for the bottom fifth. 2. Share of households with no earners. More than 63% of American households in the bottom fifth of households by income had no earners for the entire year in 2017. In contrast, only 4.3% of the households in the top fifth had no earners last year, providing more evidence of the strong relationship between household income and income earners per household. 3. Marital status of householders. Married-couple households represent a much greater share of the top income quintile (76.1%) than for the bottom income quintile (17.1%), and single-parent or single households represented a much greater share of the bottom one-fifth of households (82.9%) than for the top one-fifth (23.9%). Consistent with the pattern for the average number of earners per household, the share of married-couple households also increases for each higher income quintile, from 17.1% (lowest quintile) to 35.3% (second lowest quintile) to 48.1% (middle quintile) to 63.5% (second highest quintile) to 76.1% (highest quintile). 4. Age of householders. 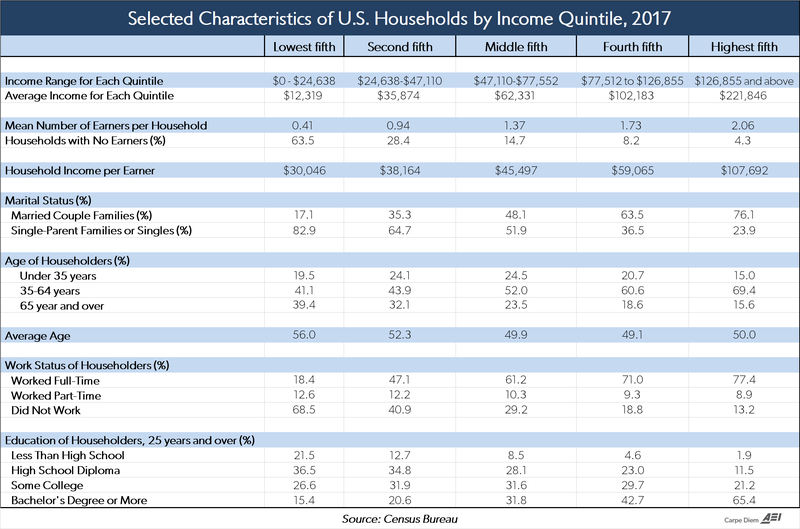 About 7 out of every 10 households (69.4%) in the top income quintile included individuals in their prime earning years between the ages of 35-64, compared to fewer than half (41.1%) of household members in the bottom income quintile who were in that prime earning age group last year. The share of householders in the prime earning age group of 35-64 year-olds increases with each higher income quintile, from 41.1% (lowest quintile) to 43.9% to 52.0% (middle quintile) to 60.6% to 69.4% (highest quintile). Compared to members of the top income quintile of households by income, household members in the bottom income quintile were more likely (19.5% for the lowest quintile vs. 15.0% for the highest quintile) to be in the youngest age group (under 35 years), and more than twice as likely (39.4% vs. 15.6%) to be in the oldest age group (65 years and over). By average age, the highest three income groups are the youngest (about 50 years on average) and the lowest income group is the oldest quintile on average (56 years). 5. Work status of householders. More than four times as many top quintile households included at least one adult who was working full-time in 2017 (77.4%) compared to the bottom income quintile (only 18.4%), and five times as many households in the bottom quintile included adults who did not work at all (68.5%) compared to top quintile households whose family members did not work (13.2%). The share of householders working full-time increases at each higher income quintile (18.4% to 47.1% to 61.2% to 71.0% to 77.4%). 6. Education of householders. Family members of households in the top fifth by income were 4.2 times more likely to have a college degree (65.4%) than members of households in the bottom income quintile (only 15.4%). In contrast, householders in the lowest income quintile were 11.3 times more likely than those in the top income quintile to have less than a high school degree in 2017 (21.5% vs. 1.1%). As expected, the Census data show that there is a significantly positive relationship between education and income. Bottom Line: Household demographics, including the average number of earners per household and the marital status, age, and education of householders are all very highly correlated with household income. Specifically, high-income households have a greater average number of income-earners than households in lower-income quintiles, and individuals in high-income households are far more likely than individuals in low-income households to be well-educated, married, working full-time, and in their prime earning years. In contrast, individuals in lower-income households are far more likely than their counterparts in higher-income households to be less-educated, working part-time, either very young (under 35 years) or very old (over 65 years), and living in single-parent or single households. MP: It’s highly likely that most of today’s high-income, college-educated, married individuals who are now in their peak earning years were in a lower-income quintile in their prior, single, younger years before they acquired education and job experience. It’s also likely that individuals in today’s top income quintiles will move back down to a lower income quintile in the future during their retirement years, which is just part of the natural lifetime cycle of moving up and down the income quintiles for most Americans. So when we hear the media and progressives talk about an “income inequality crisis” in America, we should keep in mind that basic household demographics go a long way towards explaining the differences in household income in the United States. And because the key income-determining demographic variables are largely under our control and change dynamically over our lifetimes, income mobility and the American dream are still “alive and well” in the US.